The first video, entitled ‘Loved,’ is an energetic creation that starts with a rousing backing track and almost immediately kicks in with a powerful voiceover that introduces the iPhone. The voiceover proclaims that the iPhone “comes with something different,” citing the fact that 99% of those who own an iPhone “love” their iPhone. Scrolling through a massive mosaic of iPhone 6’s, the ad shows the device being used for various things – like FaceTime calling, media messaging, capturing HD video, and even distributing the odd emoji here and there. The second video, dubbed ‘Hardware & Software,’ is a thirty-second clip that focuses on the fact that Apple designs both the hardware and the software to work harmoniously together. The video is extremely simplistic but does a fantastic job of getting across the mantra that “the hardware part makes the most of the software part, and the software part makes the most of the hardware part.” An extremely simple concept but one that users sometimes don’t appreciate. “When you design the whole phone, all of the parts work together as one amazing part”. 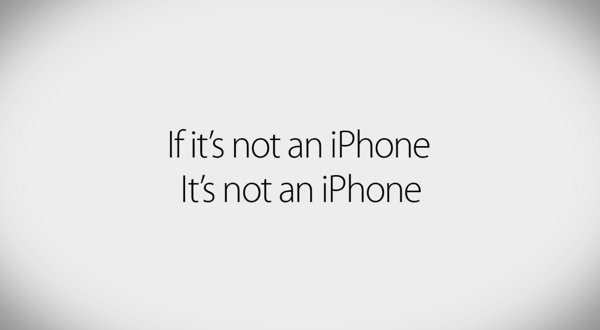 A very simple, logical but extremely powerful message that sets the iPhone apart from the competition. Both videos last for a duration of thirty-seconds and sign off with the tagline “if it’s not an iPhone, it’s not an iPhone,” which is a homage to Apple’s previous “if you don’t have an iPhone, you don’t have an iPhone“ campaign that was so popular a few years back when the iPhone 4 was knocking around. As we move closer to an announcement regarding the next-generation iPhone, it looks like Apple is ramping up its marketing machine in an attempt to clear stock of older and current-generation devices. Check out both the TV ads which we have embedded below and let us know what you think about them in the comments section. These are some horrible pointless commercials that don’t make anyone feel good. iPhone users or anyone considering an iPhone. Haa gayyyyyy! Community TV Show reference. It got a reaction so it had some impact on you. It’s not their best.. Kinda mediocre at best case and the tag line “if it’s not an iPhone, it’s not an iPhone…” is downright lame and stupid. Not Apple’s best marketing work by far. AT&t a database renew, this means that many սոⅼοсking sites are not able to ՍΝᏞΟᏟΚing AT&T anymore, but I know a website that does, you can google just google atttiphoneuunlocking, we are still in a job to սոⅼοсking any AT&T l0cked devices.